Is review of low chemical diet evidence useful? Skypala IJ, Williams M, Reeves L, Meyer R, Venter C. Clin Transl Allergy; 2015;5:34. The team of reviewers comment on the additives: benzoates, sulphite, MSG, as well as the natural food chemicals: amines and salicylate. They did not investigate additive colour and flavour which are the additives usually emphasised in discussions of low chemical diets. It is disappointing that reviews written on low chemical diets have not changed much in the last 35 years. Reviewers still worry that changing the fruit and vegetables used can cause nutritional deficiencies, much more than they discuss if the diet treatment is useful. They wonder if there are other reasons why people improve when they change their diet, but still cannot explain why they get worse when they eat off-diet food. Overall the authors let themselves down. 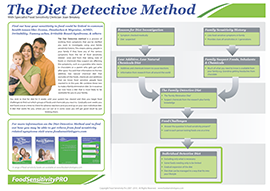 They are dietitians who chose to do their review in a particular way collecting articles on the particular additives they chose to investigate and reviewing studies where the research investigated each chemical in isolation. Readers expecting an assessment of the low chemical diet may take time to realize that this review does not provide that. On the other hand they provide a diet at the end of the review as if collecting information of some suspect chemicals in isolation provides information that will inform a diet useful for practising dietitians. As a dietitian who has conducted clinical research into the low chemical diet for forty years now I found the review very frustrating as orientation from the overall diet was lacking. This review provides many references on the particular additives and chemicals this particular group chose to investigate. Note that work was carried out by members of the group such that different authors wrote on salicylates and sulphites, benzoates and MSG, amines, and diets in children. As part of my frustration I noticed that the various reviewers noted the research problems each in the compound they studied, somewhat to show that the evidence is wanting in some way. But in doing this the review provides something worth discussing that was a by-product of all the work. They show the difficulties of conducting the robust research that scientists prefer when it is applied to this diet. They show that reviews and studies that do not address the problems they raise will not be as useful as their review intends. The other important contribution their raising of difficulties of research has provided is just how complex all aspects of this treatment are. In this article I have collected the many difficulties their various researchers raise, explained why they are such a problem to this area of research, and how they could be better managed. I will collect them in relation to five aspects: how different this research is from double-blind research into one medicine being tested, issues with regard to the compounds being investigated, to the subjects being studied, the symptoms that are relevant to this research, and the biochemistry and metabolism of the suspect chemicals. Research problem: performing DBPC challenges with a diet. Why this is a problem: research with one medicine tablet is straightforward whereas there is a need to agree on the necessary baseline diet that excludes all suspect chemicals in this diet. Solution: there is a need to understand that it is difficult disguise challenges so that the people in the study cannot see or taste the active compound. Research problem: ruling out potential co-factors. Why this is a problem: unlike trialling one medicine, where diet is concerned it is difficult to incorporate individual variation in diet implementation, change in stress or infection level, and environmental smells while running a diet trial. Solution: researchers can note potential co-factors in initial improvement and also note degree of deterioration after challenge while co-factors remain stable. Research problem: deciding on dosage for the studies. Why this is a problem: there has not been a discussion about the probable high end of the normal dose of each suspect chemical being studied and many studies do not minimise all groups such as suspect fruit or chocolate. Solution: The dose required for each challenge needs to be as great as the usual intake to test tolerance. And it needs to be much greater where the test diet has not exclude all suspect substances. Research problem: two researchers separately noted that only 16% of those who reacted to wine reacted to the sulphite in wine, and that there is there no correlation between wine histamine content and wine intolerance. Why this is a problem: note the problems that arise when with researching the number who react to one preservative, or to one suspect chemical in a food. Results may be interpreted as not showing reactions that are happening for different reasons. Solution: clinical research can record how many react to wine and investigate whether this is sulphites, amines or salicylates at an individual level by noting factors in the particular wine, or what other foods the patient reacts to. Research problem: knowing that a substance such as benzoate is naturally present in milk products but not knowing if this is relevant to recommended exclusions. Why this is a problem: this is a problem for reviewers who are looking at presence or absence of a chemical, while not knowing its relevance. Solution: These issues are managed in clinical research by recording numbers who reacted to the doses of benzoates in a natural mild lemon flavoured, uncoloured soft drink, who did not also react to milk. Research problem: suspect chemicals vary in foods dependant on stage of ripening and any processing or storage time, and for amines with the type of bacteria, food composition and conditions of fermentation. Why this is a problem: these very important comments show why many of the trials discussed in this review have limitations, and therefore so do their conclusions. Solution: this can be better managed by using a baseline diet with the detail such as those provided by RPAH or my Diet Detective Process, or in the early studies which did exclude the breadth of suspect compounds needed. No baseline diet is perfect in the way a lactose-free diet can be, but diets which lower enough foods and provide guidelines on factors to consider mean clinical research and practice can be effectively done. Research problem: concern about dietary salicylates compared to other bioactive phenolics in plants in the diet. Why this is a problem: the diet has emphasised salicylates because they are chemically similar to additive colours and flavours and benzoates. It is true that correlation between analysis from different universities and tolerance of the suspect foods is not very high. Solution: it is the hypothesis of this reviewer that other relevant bioactive phenolic are the flavours in foods, as tolerance is dependent on the quality of the flavour to the sensitive person. This is discussed in detail in my book Tolerating Troublesome Foods. Research problem: uncertainty of bioavailability of dietary salicylate, it is low in most people so unlikely to be a problem. Why this is a problem: this is a worthwhile note but it may not be relevant as the assumption in the hypothesis is that a sub-group in the population are more susceptible. Solution: clinical management and research needs to work with the susceptible group rather than the whole population. Note that reports adverse reactions to salicylate in food sensitive families is frequent. Research problem: setting inclusion criteria. Why this is a problem: double-blind studies of medications are carried out on the diagnostic group presumed to respond. The problem here is that the food sensitive people are not defined by one diagnostic category. They are a genetic portion of each reported symptom. Solution: best management has occurred where the researchers have run a preliminary trial of a baseline diet to find the diet responders who can then be tested with the double-blind methodology. Why this is a problem: this is a big problem as there is no easy or clear criteria to define the food sensitive group. They are people who have shown by diet investigation, including challenges, that they are food sensitive, and are prepared to adhere to diet. However the prevalence being unknown does not mean the diet may not be useful. Solution: until the mechanism is found and a test available the prevalence cannot be known. Research problem: the possibility that some within a diagnostic category are at higher risk; steroid dependant asthmatics are quoted as an example. Why this is a problem: this is an example of a co-factor that adds more complexity on top of the fact that only some of each diagnostic category are diet responders. Solution: through following up symptoms that improved in diet-responding families in my clinical research I have found that taking a Family Sensitivity History of any of the usual symptoms, and suspect foods thought to cause reactions, does show the subgroup most likely to respond to diet. Research problem: those who are sensitive to a suspect substance may not all respond in the same way. Why this is a problem: this makes research difficult as food sensitive people each have their own cluster of symptoms, and response is a shift towards improvement, which again may be variable amounts in different symptoms. Solution: outcome is best measured on a standardised before and after assessment questionnaire for whichever symptoms are being investigated. Research problem: there is limited good quality research about low chemical diets in children. Why this is a problem: it is to their discredit that the reviewers did not look at the huge amount of early work investigating the Feingold Diet, which was the adaptation of the early low additive, low salicylate diet from dermatologists. Research problem: different members of the reviewer group note that the weight of evidence does not support an MSG-free diet, nor a benzoate free, nor a low amines diet for chronic headaches. Why this is a problem: the problem is that the researchers and reviewers do not understand that sensitivity to particular food chemicals is in the person, not related to a particular symptom, so that one person may be sensitive to all three, and another chronic headache sufferer may not be sensitive to any of them. Solution: this can be managed by research that begins with a baseline diet that is a screening diet, and research is conducted on those who have responded to the screening diet, noting which people react to particular chemicals. Research problem: evidence for a prevalence of 2.5% of Europeans as salicylate sensitive is sparse. Why this is a problem: – this is likely as the data on sensitivity to aspirin, nor of sensitivity to salicylate in food, is not usually collected, particularly as there is no useful definition of salicylate sensitivity. Solution: prevalence may be investigated well into the future when there is a test for salicylate sensitivity. Research problem: standardisation of the outcome. Why this is a problem: diet benefit is a shift in severity of symptoms, rarely from the same starting point. Solution: as mentioned above, the outcome needs to be a standardised before-and-after assessment questionnaire for whichever symptom is being investigated. Research problem: difficulty in diagnosis of the many symptoms attributed to food chemical intolerance [FCI]. Why this is a problem: yes, many of the symptoms are not neatly diagnosed. Doctors may differ in what constitutes ADHD, IBS, migraine, chronic headaches or infantile colic. Allergic conditions such as eczema, asthma, hay fever, diarrhoea, are somewhat easier. Solution: recording the various symptoms and severity, before and after diet and challenges, is necessary. Research problem: difficulty of reviewing the range of potential suspect chemicals. Why this is a problem: reviewers choose the chemicals they wish to investigate and, as in this research, they investigate them where they have been implicated in isolation, not as part of the challenges in those who are having the whole diet investigated. For some reason these researchers did not investigate additive colours, flavours, and preservatives other than benzoates, MSG, and sulphites, [nitrates, sorbates, propionates, BHA and BHT] even though they are presumed as part of the low chemical diet mentioned in the title. Solution: this could be better managed by reviewing all the chemicals that are part of the low suspect chemical hypothesis and that clinical research has implicated. Research problem: differences in reactivity occurred when the chemical was tested on its own versus in food. Why this is a problem: this is a problem as researchers who use the chemical on its own may conclude there is no reaction when people eating the food do report reactions. It is whether the food produces a reaction that is important. Solution: this can be managed by comparing the amounts shown by analysis in various foods to the number of patients who report the food causing reactions. Research problem: that it is unknown whether foods high in natural bound or free form glutamate can cause the same symptoms as added MSG. Why this is a problem: it adds to the complexity of food sensitivity. It means that each needs to be investigated separately. Solution: the research shows that some people react to MSG. The next step is for clinicians to guide patients through food testing so they know which forms of glutamate they can tolerate. The symptoms may be similar but the severity may be different. Research problem: genetic variants associated with the breakdown and clearance of histamine were found to moderate the impact of additives on behaviour. Why this is a problem: this is another very interesting note in the review but not considered any further. It adds weight to my hypothesis that food sensitivity is part of genetic inheritance. Solution: this can be researched further in the future when more about the genetics of this group is known and so research into food sensitive children can become detailed enough to incorporate these sort of issues. Research problem: children with low levels of DAO [diamine oxidase] improved on a diet with low levels of histamine. Why this is a problem: this is valid since diamine oxidase is used in the metabolism of amines. However it is no practical use until tests for levels of this and another enzymes are easily available. Solution: in future clarifying who has low DAO may show a sub-group who are sensitive to particular amines. There probably are several enzyme systems not functioning normally in food sensitive people. Overall the reviewers did much work with many references provided. However the title, abstract, aims and conclusions do not connect well. The title of the article gives impression they will review evidence on the diet excluding food additives, vasoactive amines and salicylates yet they reviewed components, not the whole diet. They then provided a suggested diet with foods likely to be high in food chemicals, neglecting several foods known to cause reactions. This review is lacking in awareness of clinical findings. If someone researching the effect of alcohol on people researched some types of drinks and suggested excluding some but not all types of alcoholic drinks it would be similarly lacking in usefulness. Conclusion: By pointing out all the problems in the research the authors also show that double-blind research methodology in this area is not a useful methodology for clarifying the usefulness of this diet treatment. By showing how complicated this area of work is they verify the work done by many clinical researchers summarised in my Review Article in the JPCH 1998, the PhD thesis by Dr Anne Swain, and my work including articles on the Development of the diet, Why after 30 years is this diet treatment still controversial? and the presentations in 2012 at ICD, on gaps in the research in diet and ADHD and the pathway to management, all easily available on my website. Dear Joan…Congratulations on your brilliant and informative articles. My husband Barry, does well on a really low salicylate diet for his PUSTULAR PSORIOSIS….BUT…the moment he deviates or tries to add some salicylates…only one at a time…. back into his highly restricted diet….he suffers from another outbreak of his pustules. Nasty things…only on the one index finger of his left hand. So frustrating for him…and me….trying to think of ways to incorporate his favourite dishes and the problems of ‘eating out’. where she says magnesium is necessary for 700 to 800 enzyme actions and we are all quite deficient now so no wonder most of us have digestive problems. Thank you for appreciating the effort I go to with reviews, so we can learn what the research world is saying, as well as discussing how to manage the low chemical diet better. Your comment about magnesium is a good reminder that we should always also attend to the nutrition of our diet. Magnesium is an important nutrient which our body holds well for all these enzymes.But we do still need to make sure we are having it in food too. Good sources of magnesium are wholemeal, and rye breads, so in wheat bran, and in soy flour products. Brazil nuts are a very good source so should be included in those who cannot have wholemeal products.Peanuts are good too and so peanut butter is a good source for kids; even sesame bars are useful. Smaller amounts are also present in a wide variety of meats and fruit and veges, reminding us to eat a wide variety of foods to get magnesium and all the other nutrients we need. Like all minerals it is not good to have high doses from supplements.